Body Fortress Super Advanced Whey Protein features a Super Recovery Blend to further enhance the benefits of our premium Whey Protein Blend. Each scoop provides high quality creatine in combination with the important amino acids crystalline taurine and threonine. 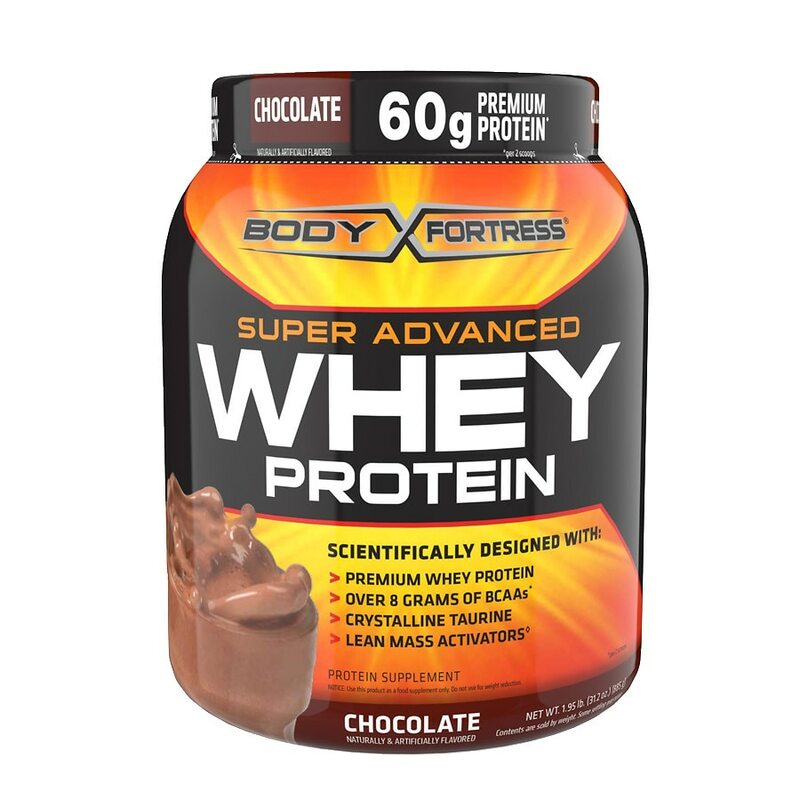 Body Fortress Super Advanced Whey Protein provides cross-flow, Ultrafiltered Whey Protein Concentrate. Premium Whey Proteins for easy mixing & complete dispersion in liquid. Body Fortress Super Advanced Whey Protein is aspartame free. Please note: Crystalline Taurine will appear as small crystals within the powder. ††L-Tryptophan is naturally occurring, not added. For adults, add 1 scoop (42g) to 6 – 8 ounces of water or your favorite beverage daily. Serious athletes and bodybuilders (over 125 pounds) should consume 1 – 2 scoops immediately after exercise. Blender - Simple: Cover and blend for 20 – 30 seconds (for mass gaining: Add higher calorie foods such as peanut butter, 1 – 2% milk, and fruit juices. For dieters: Add lower calorie foods such as skim milk or just use water.). Shaker - Simpler: Cover and shake for 25 – 30 seconds. Glass and Spoon - Simplest: Stir for 20 – 30 seconds or until completely blended. Store at room temperature, tightly closed and avoid excessive heat. Use in conjunction with an intense daily exercise program and a balanced diet including an adequate caloric intake. Contains milk and soy ingredients. Notice: Use this product as a food supplement only. Do not use for weight reduction. Not intended for use by pregnant or nursing women. If you are taking any medications or have any medical condition, consult your doctor before use. Avoid this product if you have kidney disease. Discontinue use and consult your doctor if any adverse reactions occur. Not intended for use by persons under the age of 18. Keep out of the reach of children. For your protection, do not use if seal under cap is broken or missing.